Coronal rain: Streams of ionized gas rain on Sun after a solar flare. 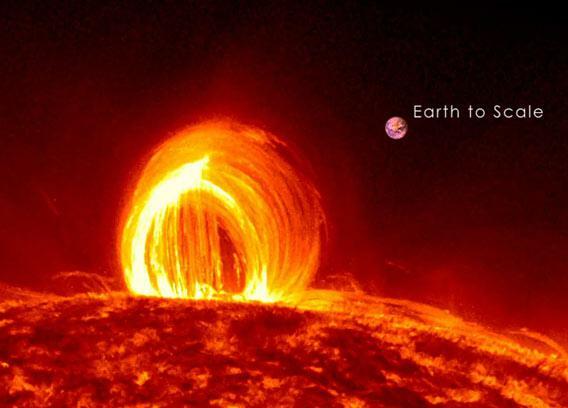 Towering loops of plasma raining down on the Sun, with the Earth thrown in for comparison. Click to embiggen. Although this looks like fire, it’s not. The images used to make this video are in the far ultraviolet, showing gas at a temperature of nearly 100,000° Celsius (180,000° F). The color is added after the fact to make details easier to see—but those fiery red, yellows, and oranges do tickle the imagination, don’t they? The color adds to the impression of dancing energy and heat. The bright flare happens when the stored magnetic energy erupts outward, usually due to what is essentially a short-circuit in the field. That happens near the beginning of the video, and is so bright it saturates SDO’s detectors (and you can see repeated ghost images to the upper left and right of the flare as the light reflects inside SDO’s optics). Then things settle down, and that’s when the beauty really begins: The plasma flows down the loops, raining down onto the Sun’s surface. And it goes on and on. This video represents a total elapsed time of over 21 hours. * The energy flowing along those magnetic loops is immense, enough to power our entire planet for many millennia. Note the part about a minute in when the size of the Earth is shown for comparison. Incredible.